364 Marlborough is located on the SE corner of Marlborough and Hereford, with 362 Marlborough to the east, across Hereford, 370 Marlborough to the west, 363 Marlborough to the north, across Marlborough, and 27 Hereford to the south. 364 Marlborough (25 Hereford) was designed by Alfred S. Bither, architect, and built in 1879 by Goldthwait & Chapin, masons, for building contractor Samuel Tarbell Ames, one of four contiguous houses (364 Marlborough and 27-29-31 Hereford). He is shown as the owner on the original building permit application, dated March 27, 1879. Samuel Ames built the houses for wire and cable manufacturer Charles Anthony Morss, for speculative sale. He and his wife, Mary Elizabeth (Wells) Morss, lived at 323 Marlborough. 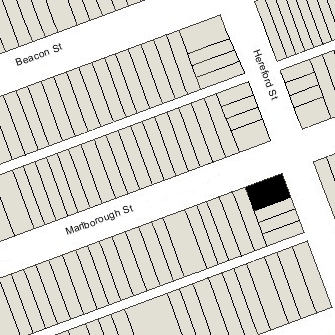 Click here for an index to the deeds for 364 Marlborough, and click here for further information on the land on the south side of Marlborough between Hereford and Massachusetts Avenue. On October 10, 1879, 364 Marlborough was purchased from Charles Morss by Laura W. (Hitchcock) Loring, the widow of Hollis Loring. She previously had lived at 70 East Newton. Living with her were five of her adult children: Hollis Seldon Loring; Kate W. (Loring) Moulton and her husband, Barron C. Moulton, a lawyer; Charles Francis Loring, a lawyer; Fred L. Loring, a retail grocer; and Victor Joseph Loring, a lawyer. Barron Moulton, Charles Loring, and Victor Loring were law partners. Also living with her was her unmarried sister, Louisa Hitchcock. Louisa Hitchcock died in April of 1883. 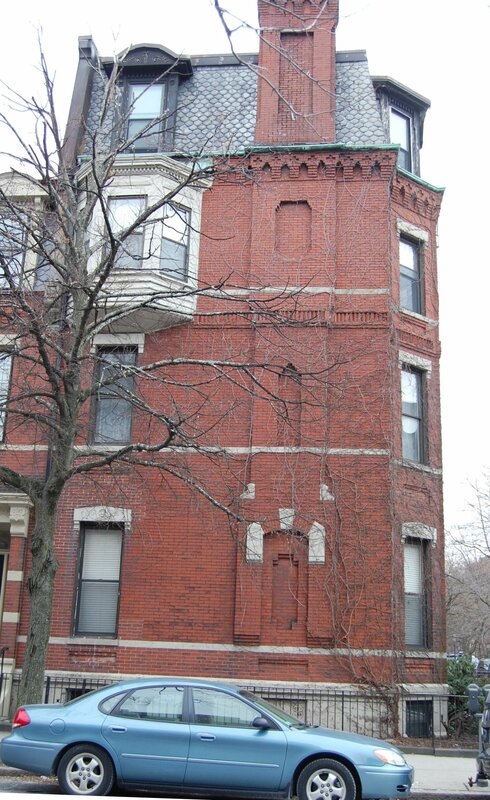 By 1884, the Lorings and Moultons had moved to Allston. Laura Loring continued own 364 Marlborough and lease it to others. By the 1883-1884 winter season, 364 Marlborough was the home of banker Stephen Moody Crosby and his wife, Anna (Hayden) Crosby. They previously had lived at the Hotel Berkeley (southeast corner of Berkeley and Boylston). They had no children. By the 1885-1886 winter season, they had been joined by Ann Crosby’s niece, Miss Gertrude Estelle Hayden, the daughter of Thomas Hayden and Elizabeth (Eaton) Hayden. On March 31, 1888, Stephen Crosby acquired 364 Marlborough from Laura Loring, and on March 1, 1889, he transferred the property to his wife. Anna Crosby died in June of 1903; in her will, she left 364 Marlborough to her husband. He continued to live there with her niece. Stephen Crosby died in August of 1909. In his will, he specified the right of his niece to remain a resident of 364 Marlborough for twelve months after his death, with all expenses paid by his estate. He also named her co-executor with attorney Robert S. Gorham. Gertrude Hayden continued to live at 364 Marlborough during the 1910-1911 winter season, but moved thereafter to The Holland at 50 Commonwealth. 364 Marlborough was not listed in the 1912 and 1913 Blue Books. On February 8, 1913, 364 Marlborough was purchased from Stephen Crosby’s estate by Arthur Hazard Dakin, a lawyer. He and his wife, Emma Frances (Sahler) Dakin, made it their home. They also maintained a home in Amherst which previously had been their primary residence. They continued to live at 364 Marlborough in 1917, after which they made their home in Amherst. He continued to own 364 Marlborough and lease it to others. 364 Marlborough was not listed in the 1918 and 1919 Blue Books. During the 1919-1920 winter season, it was the home of Lt. Colonel D’Arcy Hemsworth Kay and his wife, Jane Heartt (Cragin) Kay. He was an officer in the British Army. During the 1920-1921 winter season, 364 Marlborough was the home of George Dotson Haskell and his wife, Blanche (Valentine) Haskell. They previously had lived in Concord. They also maintained a home in Marblehead. George Haskell was a glove manufacturer in 1920. By 1925, he was president of the Bausch Machine Tool Company in Springfield. By the 1921-1922 season, they had moved to 14 Gloucester. By 1922, 364 Marlborough was the fraternity house of Boston University’s Sigma Alpha Epsilon fraternity. It continued to be located there in 1924. On July 14, 1924, 364 Marlborough was acquired from Arthur Dakin by Martha G. (Gately) Cogan, the widow of Thomas Francis Cogan. She lived at 47 Prentiss. During the 1924-1925 winter season, 364 Marlborough was the home of Annie Jane (Trimble) Varney, the widow of John R. Varney, who probably operated it as a lodging house. She previously had lived at 272 Newbury. She moved in 1925 to 221 Newbury. By the 1925-1926 winter season, 364 Marlborough was the home of Anna Louisa (Austin) Walters, the widow of William Walters, and her sister, Blanche (Austin) Wharton, the widow of George Wharton. They had lived together in Long Beach, California, in 1920, and then in New York. They operated 364 Marlborough as a lodging house. On June 5, 1934, the Massachusetts Hospital Life Insurance Company foreclosed on a mortgage it held on 364 Marlborough and took possession of the property. Anna Walters and Blanche Wharton continued to live at 364 Marlborough in 1941, but moved thereafter to 391 Marlborough. On July 2, 1941, 364 Marlborough was acquired from Massachusetts Hospital Life Insurance by George Emules LeTendre and his wife, Rose (Sylva) LeTendre, who operated it as a lodging house. The LeTendres lived at 336 Commonwealth, where they also operated a lodging house. They also operated lodging houses at 395 Marlborough from about 1941 to 1946, at 338 Marlborough in 1943 and 1944, and at 365 Marlborough in 1945 and 1936. On June 30, 1943, 364 Marlborough was acquired from the LeTendres by Harry Haddon Stultz and his wife, Dorothy Edith (Aldrich) Flagg Stultz, who operated it as a lodging house. They previously had lived in Cambridge. The property changed hands and on March 2, 1949, was acquired by Anna M. (Phippard) McLean (MacLean), the widow of Hallett Ray McLean. She previously had lived in Swanzey, New Hampshire. She continued to live at 364 Marlborough in 1950, but by 1951 had moved to 278 Commonwealth. On June 19, 1950, 364 Marlborough was acquired from Anna M. McLean (MacLean) by Evelyn Elizabeth (Grant) Hornsey, the widow of Edward Leopold Hornsey, who operated it as a lodging house. She lived briefly at 364 Marlborough, but then moved to Cambridge. On October 23, 1958, 364 Marlborough was acquired from Evelyn Hornsey by the Joseph Vincent Realty Corp., and on December 29, 1958, it was acquired from him by Frances (Fishman) Aifer, the wife of Michael Aifer, an electrician and electrical contractor. They lived in Brookline. In February of 1959, Frances Aifer filed for (and subsequently received) permission to convert the property from a lodging house into ten apartments. The property changed hands and on December 9, 1983, was purchased by Peter G. Boghossian, trustee of the Petry Realty Trust. 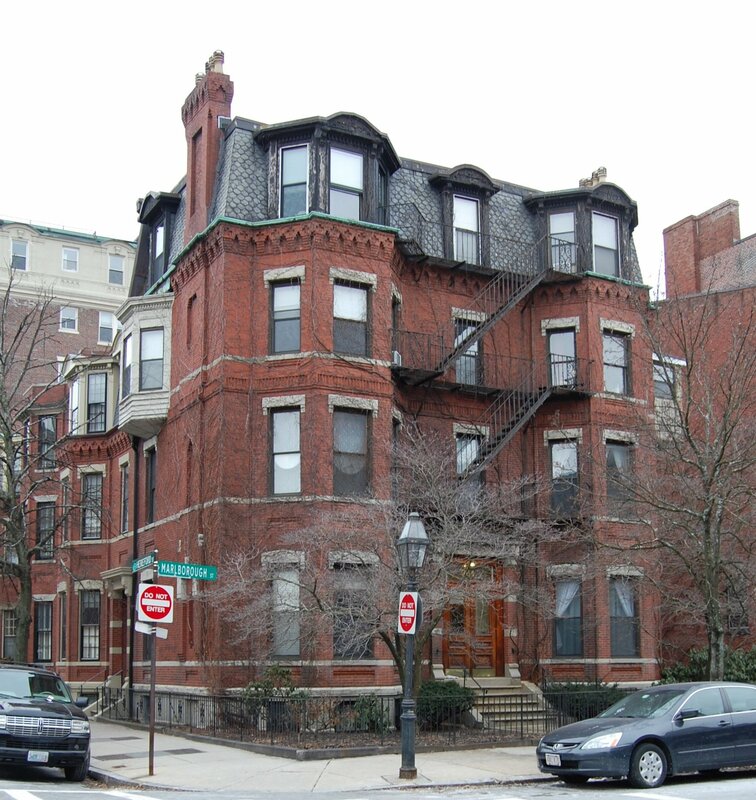 On November 7, 1986, he converted the property into ten condominium units, the 364 Marlborough Street Condominium.